A life-size Transformer car. A pancake-making robot. Vertical air hockey and more. Along with many other desirable, exciting, even outlandish high-tech toys from around the world, they will be featured during High-Tech Toys Week, part of the seasonal TV programming plans at Daily Planet. 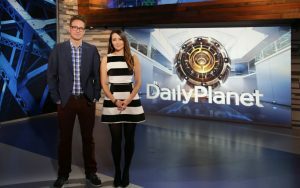 Daily Planet co-hosts Dan Riskin and Ziya Tong. That’s the science and tech culture show airing on the Discovery specialty channel; co-hosts Ziya Tong and Dan Riskin look at cool tech developments again this year in what has become one of the network’s most popular segments on one of its most popular shows. Not all of the gadgets they will describe during the week of programs are available for purchase right now; some are more like inspirational ideas and teasers to the shape of tech things to come. Some are just fun ideas from imaginative inventors; some are designed by major manufacturers to address real world problems. The Carr-E, for example, came out of a mobility challenge competition from Ford Motor Company. One of that company’s own engineers designed and built a four-wheel Segway-like vehicle for use in “all types of traffic.” It has ultrasonic sensors and built-in GPS so it and its rider can navigate safely and avoid obstacles in the way. Some further testing and perhaps a cupholder are in order, but this “electric pedestrian assistant” could mean a big change for urban commuting (someone will have to come up with dedicated lanes for these new kinds of traffic). 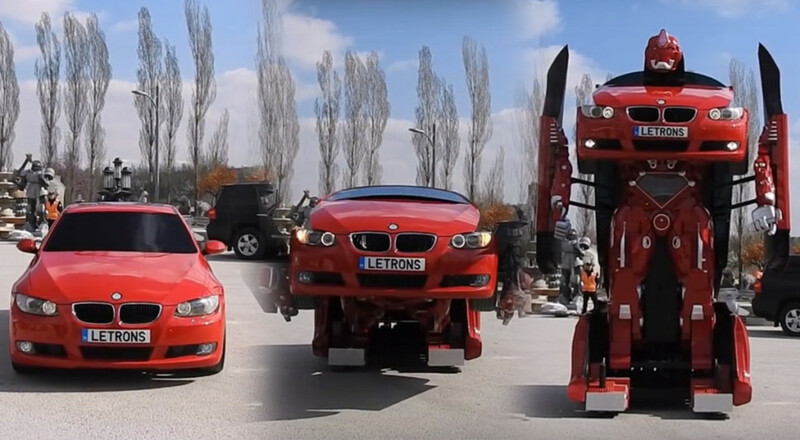 It’s a great topic — traffic and change — so how about a life-size Transformer Car? Transforming a BMW into a real-life, five-metre tall hulk of a vehicle. It’s a real-life, nearly five-metre tall vehicle with driving capabilities. A total of five working models were developed by a Turkish company, Letrons, so don’t leave space in the garage just yet. But each transformer has some 35,000 hydraulic cylinders that push and pull the car into a dramatic new shape, so who knows where it might end up. If traffic is still too slow for you, and cars of any shape too restrictive, you might check out the Amphibious Helicopter. It’s a recycled ‘copter from the Vietnam War, turned into a machine that can race on land and in water. It’s just a prototype, but the TV show co-hosts will interview the inventor, known as SpeedyCop, about this and his other novelty tech creations (not all are recycled war machines, but surely it’s a great source of raw materials). Another interview will introduce a teen-aged tech company CEO who has completed work on a rather impressive unmanned aircraft. His drone flies at more than 120 kilometres per hour and can operate in wind speeds of 64 kph. It has a built-in camera, GPS, and autonomous flight capabilities. From gaming and augmented reality to security applications and agriculture, this drone is said to be speeding to market. Fitness trackers and exercise gadgets are all the rage these days, and so a new way to get in shape will of course be featured during High-Tech Toys Week. New high-tech toys combine physical activity with augmented reality. Climball combines augmented reality gameplay and physically-engaging rock climbing. 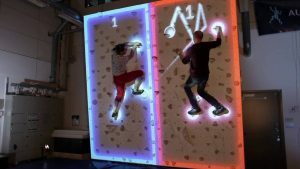 The full kit includes a powerful video projector and mounting system, and it can track players’ movements while they compete in different virtual games. Looks like fun, but in one of those ‘don’t-try-this-at-home moments’, make sure you have enough space for this high-tech toy’s set-up. Still, combining physical activity with high-tech gadgetry is a great idea. Too bad Daily Planet doesn’t have a morning edition show, as one of the great gadgets that will be featured makes pancakes! Not just pancakes, mind you, but custom-designed pancakes that have unique shapes and artistic designs. The PancakeBot is a kind of 3D food printer: a container of batter is attached to its moveable, mechanical printing arm and the target printing surface is a flat, heated griddle. Load in a pre-programmed design and dig in. 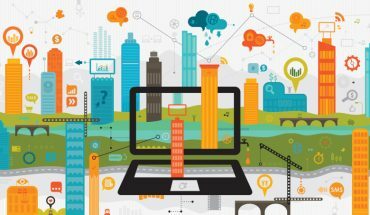 Don’t wait for any special seasonal online sale or anything (many of these toys are prototypes, as mentioned), but one of the real take-aways from High-Tech Toys Week is the spirit of innovation and imagination that’s enthusiastically conveyed by the inventors and well-documented in the show. Daily Planet airs Monday through Friday on Discovery at 7 pm Eastern time. High-Tech Toys Week begins Monday, December 5.